At Columbus School for Girls, students learn wearing a neat seasonal uniform of Campbell or Black Watch plaid skirts, white blouse, sweater and loafers. To keep things unobtrusive and non-distracting, school policy limits accessories to basic pieces like a watch, a ring, one pair of simple earrings, a necklace, and a bracelet. This demure Venetian lady from Dresden, Germany who is visiting Columbus for a few months would not only have violated CSG’s uniform policy, but also would have broken the luxury laws regulating the amount and type of jewelry that could be worn in public in the Venice of her day. She would have gotten by with her single strand of pearls, but her pearl earrings, hair adornments, ornamental belt and jeweled bracelets would definitely have been out. Here to celebrate the Columbus Museum of Art’s 140th anniversary, this bedecked beauty is on loan from the Gemäldegalerie Alte Meister in Dresden, Columbus’s sister city. The Lady in White, a portrait painted circa 1561 by the influential Venetian painter, Titian, has traveled only once before to the United States, and never to the Midwest. 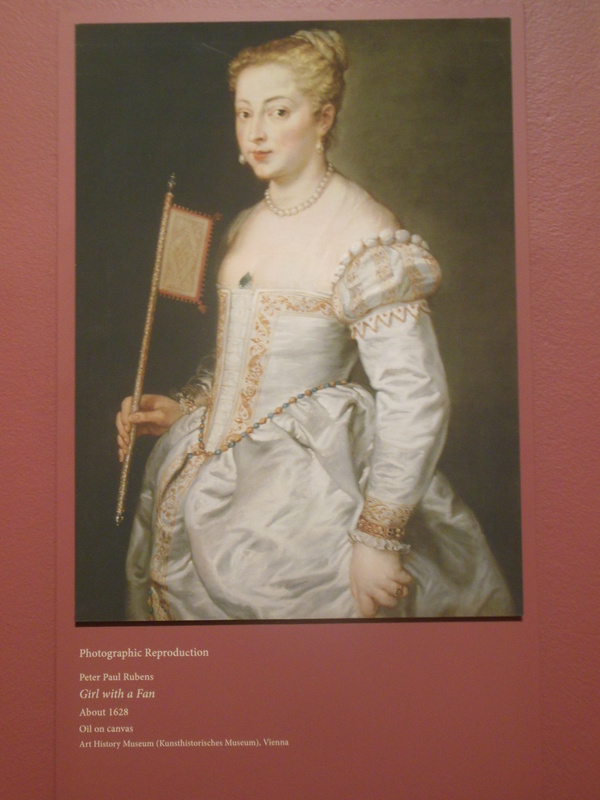 Elegantly shown in its own gallery at the Columbus Museum of Art, the painting is complemented by “great walls” of text describing the lady’s mysterious identity, the painting’s home in Dresden, its recent conservation, and the Grand Manner style of portraiture it and other portraits by Titian inspired. To correspond with the opening of the current exhibition, the Gemäldegalerie’s director, Dr. Stephan Koja, gave an insightful lecture about the painting at the museum. Titian is said to have described the subject of his painting as “the absolute mistress of my soul.” Centuries of scholars have speculated whether the graceful, obviously affluent young woman was Titian’s mistress, his daughter, or his beautiful ideal. The exhibition concludes that she did not exist in real life; therefore, she is his ideal of beauty. Whoever she is, she has real wall presence. Titian’s subject holds a flag fan, a popular accessory in Venice at the time. Her hair, likely fashionably dyed the color of gold, is pinned up in a bun enclosed in a hairnet and ornamented with pearls, rather than worn down around her shoulders, as a Venetian bride or married woman would have done. Titian is considered be the father of modern painting because of his choices of rich colors made from pigments of exceptional quality, his decision to paint on canvas instead of on wood panels, and his use of loose, expressive brushwork and paint application. This masterwork is an outstanding example of Titian’s mastery of his craft. Painting in white is difficult, and Titian excelled at it, capturing reflections of the white dress fabric. In fact, the dress in the portrait is so representative of Renaissance fashion that a pattern of it was fashioned for modern-day seamstresses. 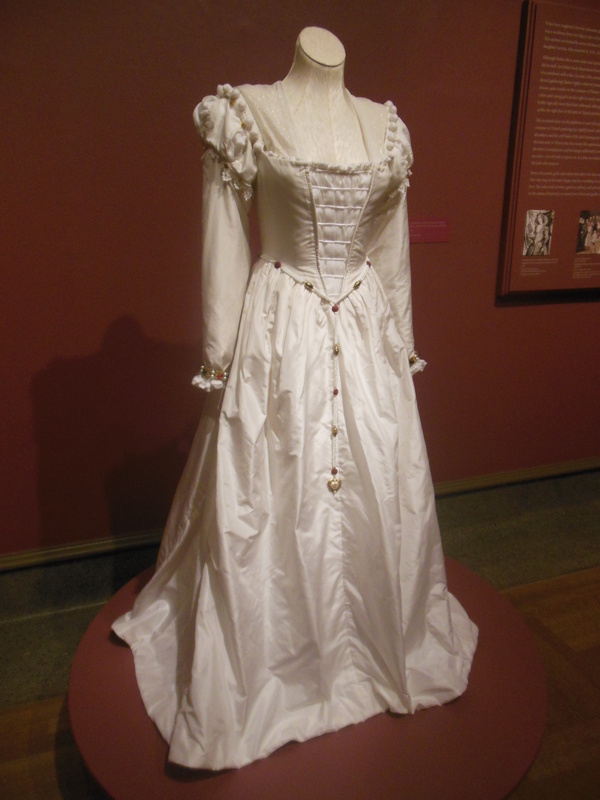 Elizabeth Hopkin, a costume seamstress and the Columbus Museum of Art’s associate registrar of collections, spent more than 200 hours creating a silk dress, which is on display in the gallery. 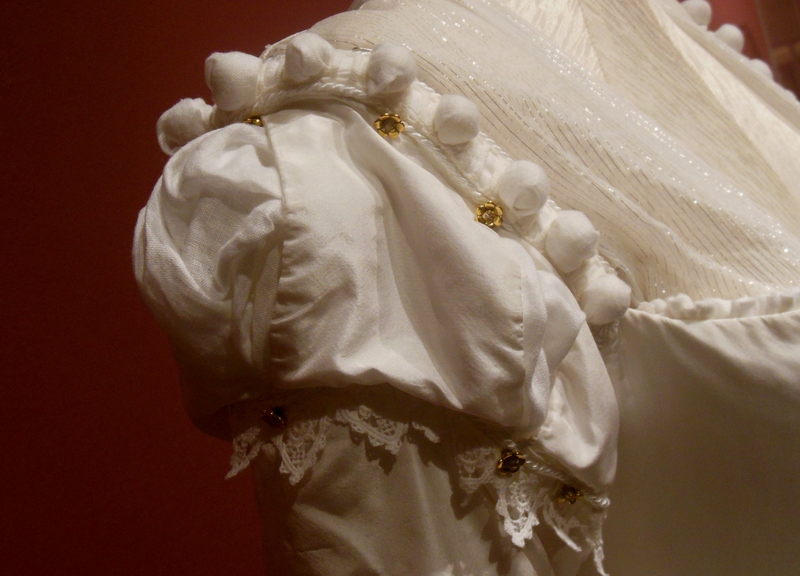 It replicates the elegant garment in the painting: a close-fitting, tightly laced bodice; slender, puffed sleeves with distinctive ornaments at the shoulders; a full skirt with a padded hem; and a chemise worn underneath the dress. Typical of Venetian ladies of the period, the lady in the painting slightly lifts her skirt, which would have provided a glimpse of the chemise’s decorative skirt. 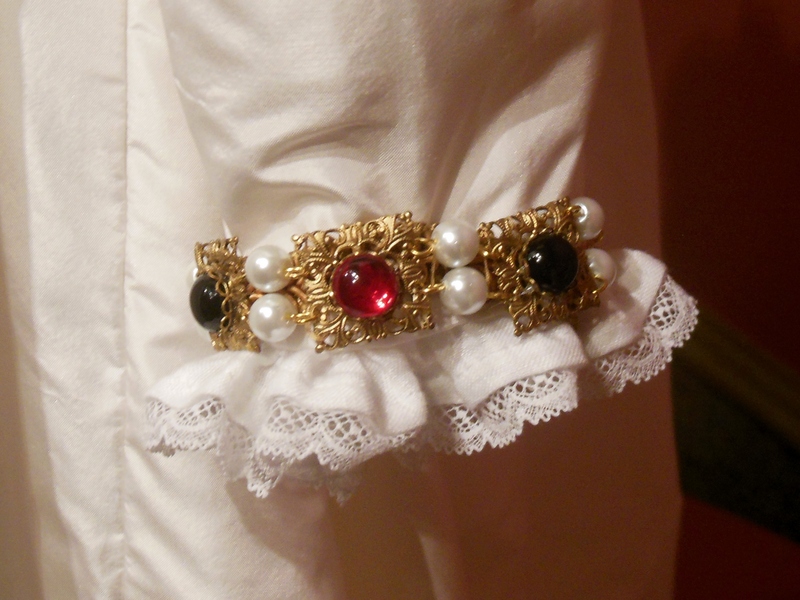 Hopkin contacted an Etsy crafter to make replicas of the pearl-embellished ornamental belt that accentuates the bodice, as well as the golden bracelets alternating rubies with pearls that adorn the wrists of the dress. 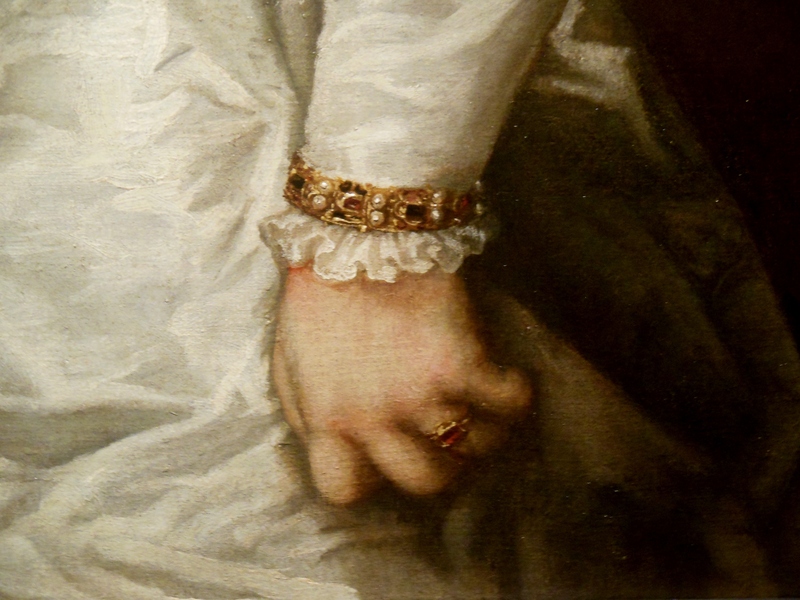 This is not the first lady in white Titian painted. He is thought to have sent an earlier version of the painting to King Philip II of Spain, which Peter Paul Rubens later copied, and is thought to have been destroyed in an 18th-century fire. Later, Titian painted a slightly different version of the Lady in White and sent it to the Italian Duke of Modena. A subsequent duke who inherited his ancestor’s impressive collection of Italian Renaissance and Baroque paintings sold about 100 of them, including the Lady in White, to Frederick Augustus II of Saxony in 1745. The paintings were wrapped in waxed tissue and packed in straw-filled wooden crates tied with ropes for their wintertime journey by carriage over the Alps to Germany. During his eight-year grand tour of Europe, Augustus II became a connoisseur of art. He wanted to add superb items to the already remarkable collection of art, precious stones, sculptures, scientific instruments, metalwork, natural objects, jewels and porcelain established by his father, Augustus the Strong. The German rulers amassed this unsurpassed collection to impress and to demonstrate their power. 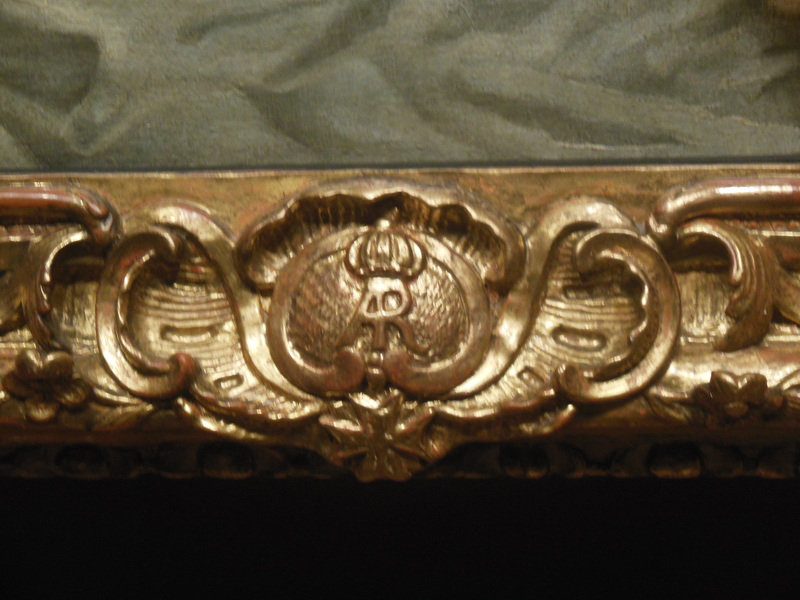 All of the paintings were fitted with specially designed, gilded frames embellished with a central monogram (AR for Augustus Rex) at the bottom and crowned with Augustus II’s coat of arms. 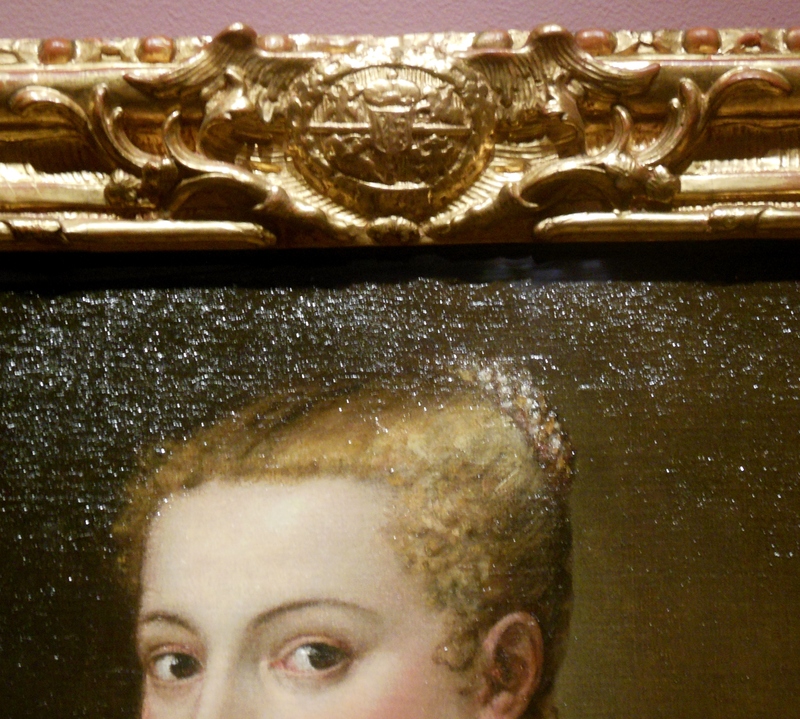 Most of the paintings retain these frames to this day. Based on a sketch Augustus II made, the paintings were hung on green damask-covered walls, from floor to ceiling, in rectangular symmetric arrangements that appear crowded by today’s standards. Important works like the Sistine Madonna were installed in central locations, flanked by pairs of other paintings. Large horizontal paintings topped the space, while small paintings were placed in the lowest row. The exhibit presents a digital reconstruction of where the Lady in White was hung in relation to the Sistine Madonna. 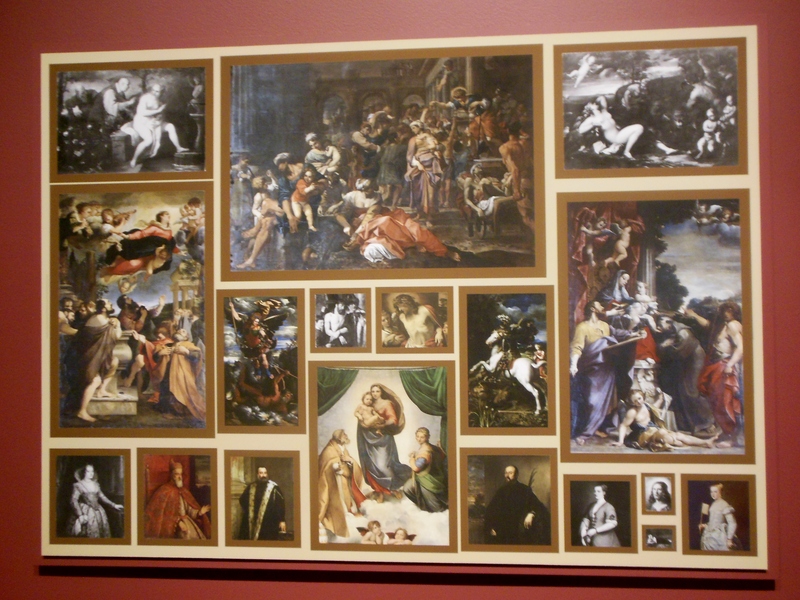 (Find the Lady in White in the bottom right corner; the Sistine Madonna is in the center of the bottom row.) The Gemäldegalerie was such a significant achievement that it was opened to the public in 1747. As its fame grew, everyday tourists and celebrated people alike made pilgrimages to see it, including Johann Wolfgang von Goethe. Writing about his trip to Dresden in his autobiography, Goethe recalled that the magnificent collection in the splendid gallery — with its dazzling gilded frames and beeswax-polished floors —- surpassed his expectations. During World War II, the Gemäldegalerie was closed and the paintings were moved out of the city for safekeeping. 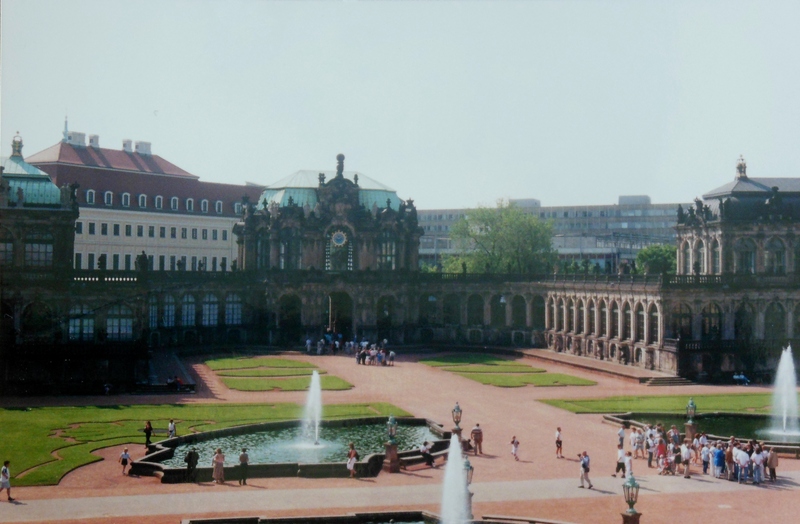 When Dresden was bombed on February 13, 1945, the Zwinger was badly damaged, but the paintings were unharmed. During Russian occupation of Dresden, the paintings were transferred to Moscow, where some were conserved; most were returned in 1955. Lady in White has been restored several times, most recently in 2006-07, when extensive retouching, overpainting, and a thick, yellowed layer of surface varnish were removed. Its original brilliant white and golden tones have been restored, revealing Titian’s skill as a colorist. A current expansion and renovation project at the Gemäldegalerie, scheduled to be completed in 2019, will integrate classical sculpture in the collection with the reinstalled paintings, illuminated by a new lighting system. Titian’s portraits led the way for what would come to be known as Grand Manner portraiture in the 18th century, where subjects dressed in expensive, fashionable clothing posed in impressive settings, often holding accessories that emphasized their wealth and social standing. 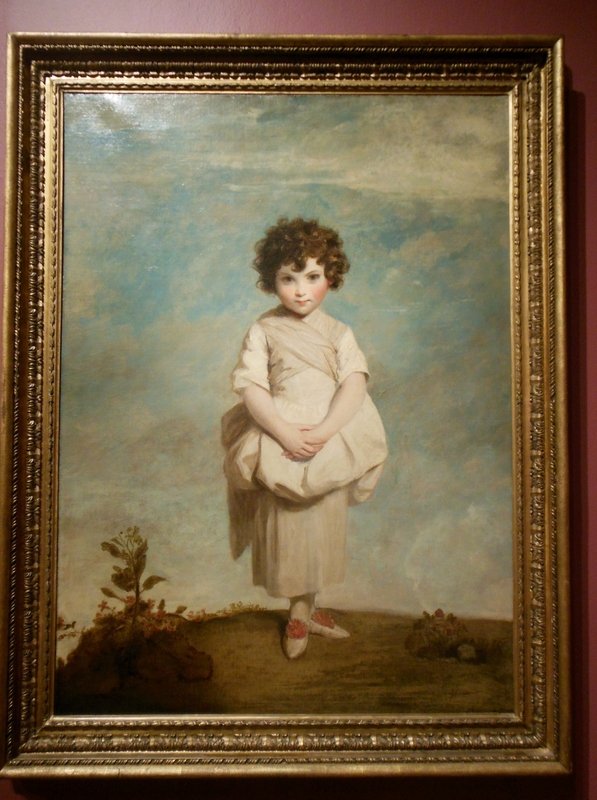 To provide context for this exhibition, curators selected four Baroque-era portraits from the Columbus Museum of Art’s collection, including Anthony van Dyck’s Christian Bruce, Countess of Devonshire; John Michael White’s Lady with a Theorbo; and Collina, Sir Joshua Reynolds’s charming portrait of Lady Gertrude Fitzpatrick, known as Collina (a form of Colleen, the name means “little mountaineer,” referring to the girl’s standing on a hill). 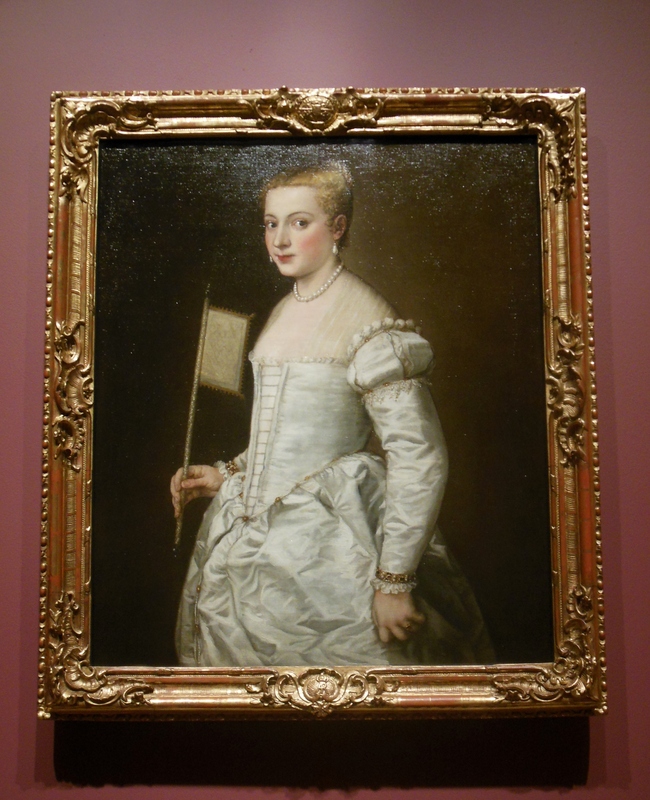 Titian’s Lady in White: A Renaissance Mystery continues at the Columbus Museum of Art through December 9. Related souvenirs available in the museum shop include a simulated glass Baroque pearl necklace based on pearl jewelry worn by women in Rembrandt van Rijn’s portraits. For more on Titian, his Lady in White and the Gemäldegalerie Alte Meister in Dresden, see Titian: Lady in White, the exhibition’s companion work, edited by the Staatliche Kunstsammlungen Dresden, Stephan Koja and Andreas Henning; Titian: Prince of Painters, catalogue for the exhibition at the National Gallery of Art, October 28, 1990-January 27, 1991; the catalogue for The Glory of Baroque Dresden: The State Art Collections Dresden, presented by The Mississippi Commission for International Cultural Exchange, Inc.; and The Splendor of Dresden: Five Centuries of Art Collecting, an exhibition at the National Gallery of Art and the Metropolitan Museum of Art in 1978-1979. This entry was posted in Art, Fashion, Germany, History, Museums. Bookmark the permalink. What a wonderful post. I found it interesting that they went to Etsy to find a jewelry artist to create the belt. Thanks. T.